Internet photo, Mine’s not much better though. I’ve been reading up on this exhaustively for the last month, trying to figure out how to remedy this. My interior is otherwise flawless, so it is especially glaring. The TLDR is: 2002 to 2005 dashes are prone to stickiness and softening. It is especially prevalent of any IS that spent time in Florida. My car was registered in said state for 10 years. 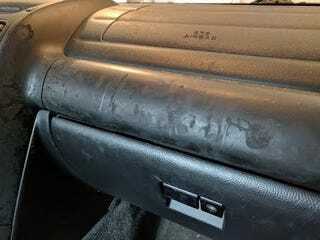 Whether it’s caused by a combination of certain cleaners and humidity, in addition to Lexus using lousy dash material (it’s both) is a topic for another day (but seriously it is those things). Because to insinuate this is Lexus’ fault (it is) would be blasphemy (no). I would like to try #3, because it sounds the least painful financially, logistically, and I don’t really have anything to lose. Except the rest of my interior is tan so I’d have to be hella careful while scraping off black goo for hours on end. I’ve steam cleaned it since then. Now it’s SPOTLESS GODDAMMIT EXCEPT FOR THE — [inhales].... dash. That being said, here’s the thing: I don’t want to remove my dash (said to take a little over 2 hours “if you know what you’re doing” according to the forums), I don’t want to pay $300 for a used dash, and another $75 for the used matching center console, and I sure as hell don’t want to pay someone else to do it. And God help us all if I suddenly I hear a rattle while driving where one never was before... But it sure would look good! Or maybe the bronze would be too much? It does match the accent color on the steering wheel, though. I paid up to have my bumper repainted because the rest of the exterior was in great shape. Being forced to stare at that dash during daylight hours pierces my heart. I must do something.